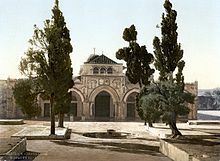 Solomon temple as of before 1910. ↑ Encyclopaedia of Islam, Second Edition. (ইংরেজি) Edited by: P. Bearman, Th. Bianquis, C.E. Bosworth, E. van Donzel, W.P. Heinrichs. Brill. Published online 2002.